The Monument Canyon Trail is a relatively long route, 6 miles, through the most spectacular scenery in Colorado National Monument, from the narrow ravine below the Coke Ovens, down the central drainage, past the isolated butte of Independence Monument and out beyond the lower edge of the cliffs to the flat lands of the Colorado River valley. 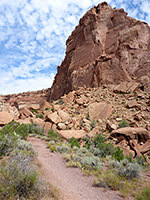 A vehicle shuttle is needed if walking the full trail, but one alternative, for a shorter, round-trip hike (5 mile loop) is to start at the eastern trailhead, walk up the adjacent drainage of Wedding Canyon, which approaches the butte from the north, then return via the lower 2 miles of the Monument Canyon Trail. This hike can be done in either direction, but anticlockwise (Wedding then Monument) is preferred as the uphill section is more shady, crossing a northwest-facing slope. 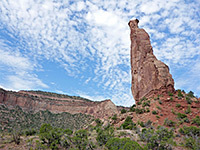 Besides fine views of the Monument and other named formations in this northern section of the park, the trail also has grand panoramas across the Colorado valley and the Fruita suburbs to the far away Book Cliffs. 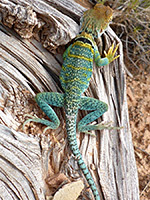 Lizards are abundant, including the bright green collared lizard, and a large colony of rabbits inhabits the sandy land beneath the cliffs. There are plenty of wildflowers in spring, though these soon wither owing to the generally hot, exposed terrain, and by midsummer the place is somewhat barren. Panorama near Independence Monument. Full screen version (17 mb). 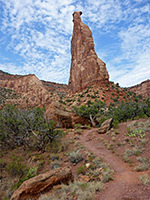 The trailhead for the lower end of Monument and Wedding canyons is along a short residential street (Fawn Lane), off Broadway, 6.6 miles by road from the visitor center. There is no fee to enter this section of the park. The smallish parking area is at the foot of a little hill, overlooked by two houses. One trail runs west from the parking area to a junction; Monument Canyon is left, Wedding Canyon right. This latter path crosses a sandy, bushy flat, then rises over a minor high point and drops down to a grassy area, after which the land is more undulating. 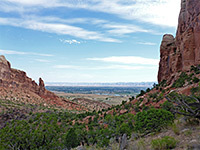 A prominent red rock is passed on the right, then the trail runs alongside a fence, round a corner, through a junction with a fainter route to Lizard Canyon (the next drainage north), and into the lower end of Wedding Canyon, also known as North Entrance, where the scenery improves, and tall, sloping walls of reddish sandstone extend southwestwards, enclosing the narrowing drainage. Many rabbits live near the canyon mouth, in burrows into the sandy slopes. The trail now ascends steeply up the south side of the canyon, staying far above the streambed, climbing over red slopes and boulders. The ground levels out near the top of the drainage, as Independence Monument comes into view, together with other spires along the upper rim, from where traffic noise is often audible, and chatter from people at the overlooks. The path crosses a saddle and descends gently to a junction, close to the Monument, which looks good, and different, from all angles. In front is a fallen, angled slab of sandstone, bearing a series of faint inscriptions; words from the Declaration of Independence, carved here by John Otto in 1911. An unofficial path leads all around the base of the butte. The trail continues, fairly flat, and rounds a corner, where the wide, middle section of Independence Canyon is now visible, stretching out to the south. 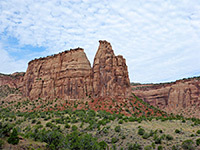 The foreground is somewhat featureless; the wide, bushy, valley floor beneath widely separated cliffs. The path moves eastwards beneath a big, curving cliff, and round another corner, now within sight of the lower end of the canyon, half a mile distant and 500 feet below. 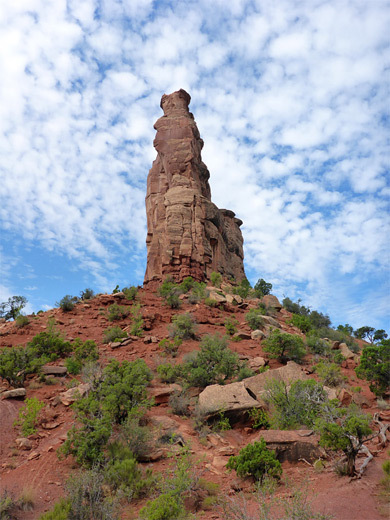 The route maintains its height a bit further, running on top of a blackish, igneous rock layer then begins a curving descent, with some steps, as this trail is maintained, unlike that through the less-visited Wedding Canyon. The path crosses a promontory, followed by a second curve down to the canyon entrance, site of a NPS register. The final section of the hike is north, along another fence near some new-looking houses, back to the initial junction.